Let your gut tell you when you have enough! 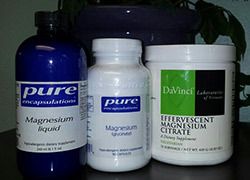 I prescribe magnesium more often than any other supplement I have in my office. Symptoms of magnesium deficiency include tight and achy muscles, headaches, back pain, migraines, sleep difficulties, as well as trouble “holding a chiropractic adjustment” (just to name a few) . I actually believe that magnesium deficiencies are at epidemic levels in this country. Approximately 75% of people have at least some level of magnesium deficiency. Things that increase our body’s need for magnesium are: stress, caffeine, alcohol and refined sugar consumption, carbonated beverage consumption and some medications. In addition, taking a nutritional supplement that has calcium in it can cause magnesium deficiencies symptoms to be exaggerated. I personally believe that replenishing your magnesium stores to the proper level can be one of the most beneficial steps you can take toward obtaining optimal health. It can take months and even years to bring your magnesium levels back to healthy levels. The RDI (recommended daily intake) of magnesium is 400 milligrams (mgs) however this is not what I feel is the optimal level or the level required to build up magnesium stores in your body especially if you have been deficient for any period of time. A better estimate for daily magnesium dosage is 650 mg for woman and 850 mg for men. If you want to fine tune that even further, you can take 5 times you body weight in milligrams (mg) of magnesium. (e.g. a 200 pound person would take 1000 mgs of magnesium daily). In order to take the optimal/higher levels of magnesium above, it is often necessary to build up to a high therapeutic level. Magnesium at increased levels has a strong tendency to cause a “loose stool” or even diarrhea. I am sure this is a side effect that most of us would like to avoid! Magnesium should be divided over at least 2 separate daily dosages. You will want to start with a low level of magnesium and build that level up slowly. You will be paying attention to when you start to get a loose stool and remain at that level for awhile. This is known as taking magnesium to bowel tolerance. (I will abbreviate that below as BT) In the beginning, you most likely will be working to increase this level to reach an optimal level. In the future however, after your magnesium stores have been replenished, you may be able to decrease your dosage. Once you reach a dosage beyond bowel tolerance (loose stool or diarrhea) reduce your daily dose by 100 to 200 mg. per/day. Very informative especially regarding increasing dosage to get to optimal level. Also, I was not aware of how taking calcium could play a role in my magnesium supplement. Thanks for posting! I eben taking Dr Carolyn Dean's ReMag for almost a month now for debilitating leg cramps. I was barely getting 2 hours of sleep a night! :( while ReMag has helped, it hasn't completely stopped the cramps ( calf, shin, ankle, feet, toes). Any suggestions? My magnesium is 400mg. So I'll start with 1 in the morning then after noon and see how that goes? And up it if I need 3 or 4?